Keith Sorensen: "Just do it like we did it in rehearsal." "Just do it like we did it in rehearsal." 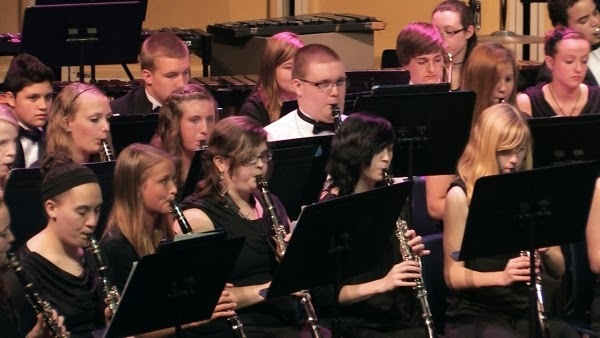 As a young band director, I was always caught off guard by how differently my band played on stage than they did in the practice room. Sometimes the drop-off was extreme, and in my first year it got to be so bad that the kids started to expect the performance to be dismal even if rehearsals were excellent. At the district festival, I happened to be talking to one of the most successful directors in the state, and I asked him what he told his kids before they went on stage to get them to play so well. His answer is the title of this post, "I tell them, 'Just do it like we did it in rehearsal.'" The simplicity of the concept stunned me. For some reason, I thought that I had to offer some sort of special advice to get my kids mentally prepared to play a concert in front of an audience. In reality, that preparation had already been done, and what I needed to do was help them to get in the exact same frame of mind they'd been in during those excellent rehearsals. Instead, I had been doing the exact opposite. I'd been putting them in a totally different headspace - essentially yanking the rug out from under their feet. "The other mental aspect that I feel is very important is understanding that all shots are the same and carry their own "intrinsic value," or their own reward and sense of satisfaction. A free throw in the first minute of the game with no score is the same as a free throw in the last second of the game with your team down 1 point. The effects of the shot may be different, but the basket is still in the same place, and so is the free throw line. The shot should be exactly the same in either case. The objective of taking a throw shot is NOT to win or lose a game. The objective is to MAKE THE SHOT! That is the only object. To inject outside values to a particular shot is a recipe for failure." It took a few more concerts after that festival, but we started to develop a new way of thinking about performance, and steadily saw an increase in the quality of our stage playing. In fact, that group's youngest players eventually became the first group to qualify for the state festival in the forty year history of the school. Here are two of the principles I've learned and still try to use whenever I perform, either as an ensemble member or the conductor. You'll perform like you practice, so practice like you want to perform. As much as you can, try to stay in the same mental space that you would if you were on stage or in the studio. When I'm preparing for an important gig, I'll record or video myself at least a few times prior to the performance. Something about knowing that I'm being recorded puts a little bit of healthy pressure on me to do my best. I can always delete the recording if it's awful, and it helps me to get used to playing in front of an audience. I watched the movie Hoosiers for the first time before I ever set foot in a band room as a beginning musician, but I think this clip exemplifies how we should approach performance. No matter how big the hall or imposing the audience, whether it's the fall opener or the state festival, a quarter note is still a quarter note, and the key of F still has one flat. And if it worked in our band room, it'll work on the stage. Just do it like we did it in rehearsal. Very kind of you to say. Thanks!